The Port of New Orleans (Port NOLA) set a new record in 2018 with 1,182,111 cruise passenger movements, up 2.3 percent compared to a year ago. A 23 percent surge in guests taking Mississippi River cruises helped buoy the total, with new and larger ships set to sail from New Orleans both in the Caribbean and on the River in 2019. A recent economic impact study conducted by LSU’s E.J. Ourso College of Business determined cruise passengers and ship crews spend an estimated $129.1 million annually in the local economy. In addition to Disney, the Port’s most prolific cruise tenant – Carnival Cruise Line – will increase capacity in its four- and five-day cruise program, replacing the Carnival Triumphon March 1 with the 2,980-passenger Carnival Glory. The Carnival Glorywill sail the four- and five-day itineraries until May 19 when it begins seven-day, year-round itineraries and the 2,980-passenger Carnival Valorarrives to sail year-round four- and five-day schedules. 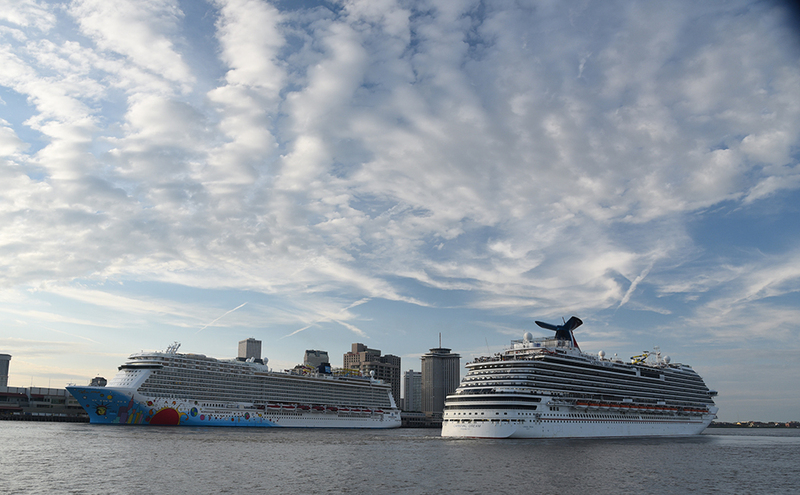 Port NOLA, the sixth-largest cruise port in the United States, also made headlines in November 2018 when it welcomed its largest cruise ship to date,the 4,000-passenger Norwegian Breakaway,which will sail seven-day cruises through April 2019. In November 2019, Norwegian Cruise Line will replace the Breakawaywith its newer sister ship, the Norwegian Getaway. December 2018 also marked the return of Royal Caribbean International when the 2,050-passenger Vision of the Seasarrived sailing seven-day itineraries through March 2019. In addition to oceangoing ships, guests traveling along the Mississippi River on the five riverboats homeported in New Orleans also set a modern-day record at 30,298 passenger movements in 2018. The American Queen Steamboat Company homeports the 436-passenger American Queenand the 166-passenger American Duchessfrom New Orleans, while American Cruise Lines offers inland cruises on the 150-passenger Queen of the Mississippi and the 185-passenger America. The company’s 184-passenger American Song, the first modern riverboat in the U.S. on the Mississippi River, debuted in 2018 and will be replaced this year by her new sister ship American Harmony.